This ancient poem was passed along to us by Jay Conner, the founder of Great Fermentations of San Rafael (our mother store). I WILL adore the Ruler, chief of every place, Him, that supports the heaven: Lord of everything. Him, that made the water for every one good, Him, that made every gift, and prospers it. May Maelgwn of Mona be affected with mead, and affect us, From the foaming mead-horns, with the choicest pure liquor, Which the bees collect, and do not enjoy. Mead distilled sparkling, its praise is everywhere. The multitude of creatures which the earth nourishes, God made for man to enrich him. Some fierce, some mute, he enjoys them. Some wild, some tame, the Lord makes them. Their coverings become clothing. For food, for drink, till doom they will continue. I will implore the Ruler, sovereign of the country of peace, To liberate Elphin from banishment. The man who gave me wine and ale and mead. And the great princely steeds, beautiful their appearance, May he yet give me bounty to the end. By the will of God, he will give in honour, Five five-hundred festivals in the way of peace. Elphinian knight of mead, late be thy time of rest. This poem refers to the famous drink of the iron age, mead, the honey wine. It is associated with warrior bravado (especially in the Gododdin) and with poetic inspiration (especially in Norse literature). 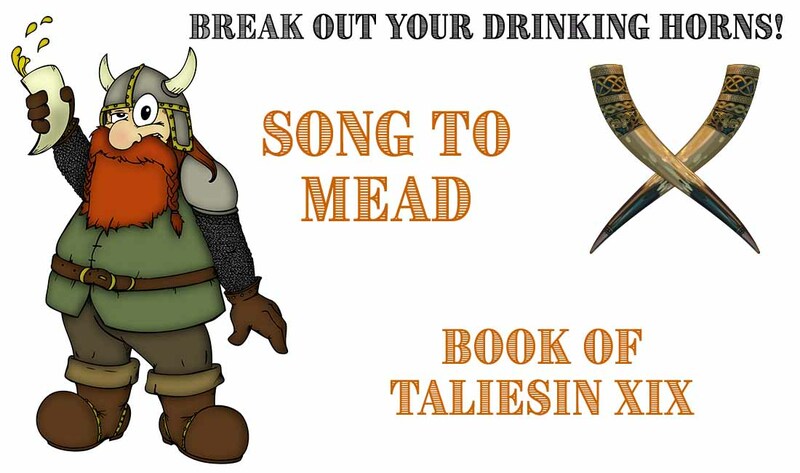 Along with being about mead, refers to the Ystoria Taliesin, wherein the young Taliesin has to free his patron and foster-father Elphin from Maelgwn Gwynedd's prisons.